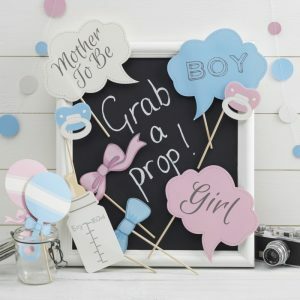 One of our best Sellers, this Baby Shower Photo Prop set contains 10 photo props for your shower. And great value at just 4.99! Team with our Baby Shower Social Media Frame for even bigger impact. Not only a fun game for the group, but also a lovely way to capture who was at the Shower for the Mummy To Be.